eRodent > Cages and Toys > Environment Enrichment. Welcome to the environment enrichment page for pet rodents. I've put a general section in for toys that are suitable for all rodents and then a section for some toys for specific groups - Guinea Pigs in particular like a different sort of toy and have their own section. I'm going to try to avoid putting too manuy links on this page as it will take a lot of keeping up to date. I will try to put that information on my Pet Shopping page although at present this is awaiting an update. Generally a google search will turn up many of the items here. Since I started this page a few years ago the market for small animal toys has expanded enormously. No longer are we improvising with cardboard boxes, flowerpots and parrot toys. This has, however led to the problem that there are some quite unsuitable toys around; just because it is being sold doesn't make it suitable. When choosing a toy look out for anything that can catch legs or feet, metal nails or staples that could be chewed out and cause injuries and any item that could be contaminated e.g. toys that are sold loose without a box or wrapping. Some materials can cause e.gut blockages when chewed - generally fluffy materials or some soft ropes and some cheap woods can get stuck in teeth or splinter and caues injuries. Chewing and ingesting plastic can be harmful and watch out for the sort of glues that are used to hold things together. Finally make sure that holes are large enough for animals not to get trapped in - a lot of small and furries like to cram themselves into small spaces and can get stuck. Frustratingly a toy can be used fine for many years with one animal and then a new one will find problems with it, for example I still have a rope perch in with Fidgit who has never shown any sign of chewing and eating it, but would probably replace it if I had another chinchilla in there. All of your animals should have the largest cage that you can get them. They spend the vast majority of their lives in their cages so an extra few inches (or preferable feet) makes all the difference. But not everyone has the room or the money for an enormous cage so the rest of this article is about other things that you can do. Everyone (with probably the exception of Guinea Pigs although I've never tried them) likes a wheel. Some animals use them more than others but they all get valuable exercise and entertainment from them. I have created a wheels page with information on where to get wheels in the UK. This is one area that has improved enormously since I spent a small fortune importing one from the US a few years back. Most small rodents, with the notable exception of hamsters and female Shaw's jirds, like company. The best way to provide this is to get two animals that have always lived together to start off with. Introducing adult animals can be difficult but there is advice available on the introductions page and elsewhere on the web. Cardboard boxes are a firm favourite of small animals. I always use boxes that have had food for human consumption on them in the belief that they would not use toxic dye on food boxes. Gerbils and Jirds love to destroy them. Degus rip them into small pieces and make a pile out of them (I believe the degu with the largest pile wins). With small boxes one of my degus walks around the cage with them proudly held in the air like a leaf cutter ant before dumping them whole on her cardboard pile. Chinchillas and Guinea Pigs hide in them, jump on them and generally destroy them. If you have several animals it can be difficult to keep up with the demand but I find that friends, family and even work mates have kindly donated their used cereal packets (they all now think I'm mad but what's new?). A note of warning - always make sure that you tear open any holes that are small enough for them to get their heads stuck in (see tubes below). We all know about toilet roll inners for gerbils but you also get cardboard rolls in wrapping paper and in the centre of carpet and many other places. None of my animals ever seems to have come to any harm with any rolls, but make sure that they are clean and if you are ever in any doubt about what they are made from don't use them. I have half a dozen carpet roll inners in my chinchilla room that are heavily used by Fidgit the chinchilla and dizzy the degu at playtime. I have had to cut the length down as Fidgit will sometimes shove herself in the middle of one and go to sleep, and they have to be short enough to pick up and place in the cage door. Blowing gently down the tube will usually dislodge a disgruntled rodent. Warning: Small animals love to stick their heads in things that are too small for them to get into properly. Then they get stuck and the best way to get bitten is freeing a scared rodent from a tube. The size of tube used for tin foil and cling film should never be given to gerbils and be careful of gerbil size tubes for Jirds and Degus. Over the years I've had animals get stuck in the most unlikely of things - gerbils are particularly prone to this as they burrow and tend to but things hard with their heads. If you are unsure about a tube you can always cut it down the side to allow room for expansion. It is possible to buy cardboard rolls in a variety of sizes called Chubes that are completely safe for small animals. Most pet shops stock these now but you can also find them in several online pet shops. There are also a range of wood and willow tubes available in various places on the web. You can also get ceramic tubes for fish tanks that are large enough for Gerbils and Persian Jirds - again watch the size of the holes in the side of them for larger rodents. These are great for making more permanent tunnels in the bedding material. 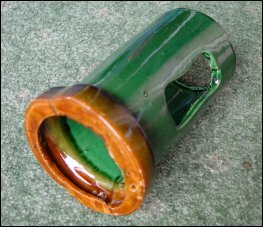 In addition you can get terracotta drainage pipes which are great for rabbits and guinea pigs particularly outside. A large range of willow and wood toys are made for rabbits. These are great for chinchillas, degus and jirds. Guinea Pigs tend to be less interested but it's always worth trying. Chinchillas love destroying these toys and they are also suitable for Jirds and Degus. Most animals like somewhere to hide particularly when they are sleeping. 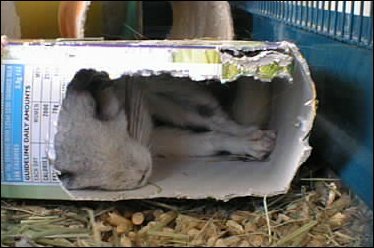 Boxes and tubes are often used but most animals like a dedicated nest box. 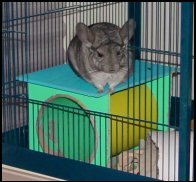 I'm not overly fond of the plywood sleeping boxes that they sell for chinchillas as they tend to be a bit small. I use large tubes and hammocks. We have used bread bins with holes cut in them in the past but now there are a range of wooden houses available. Make sure that whoever you buy it for they cant get stuck in any of the holes - some of the window in the box shown below are the right size for a guinea pig to get stuck in and I have heard of one suffocating this way. I have fixed a strip of wood over it and modern ones don't seem to have this problem any more. There are a number of ready made hanging homes and hammocks that you can buy, suitable for degus and chinchillas. However if they start to destroy them you may need to remove them if they contain stuffing - this is less of a problem with pure fleece ones. You can make your own hammock from the leg of an old pair of jeans wired on to the cage. Try to make sure that your pet can't get to too much of the wire. Here's the degu's hammock - great for storing your cardboard collection in! 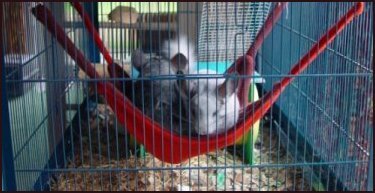 Also I must make a quick plug for Hammocky Hammocks, all funds from which are going to chinchilla rescues. They do hammocks, fleece cubes and other products. Another source of hammocks and cubes is Fuzzbutt. 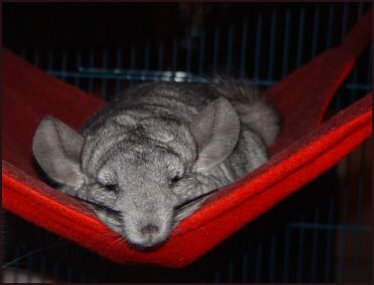 Both sites have wonderful products, the chinchillas adore sleeping in them, they haven't managed to chew them even after several months and they wash well. Degus can be more inclined to trash hammocks - Dizzy is a particular problem. But I have used the Hammocky Hammock snooze tube attached to the ceiling and a Fuzzbutt corner crush which has eyelets instead of straps with great success. I have heard reports of problems with rope parrot toys and now don't recommend them, but wooden toys and branches are suitable. I also use the rough stone perches that you can buy to keep bird's claws worn down for the degus and jirds to wear down their claws. 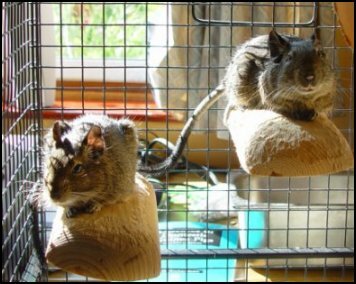 We also had a fantastic wooden parrot climbing frame at one point which the degus loved until it mysteriously changed into sawdust over time. Once upon a time it was parrot toys or bust but these days there are loads of wooden small animal toys available. I'm particularly fond of the big bags of wood pieces with holes drilled through them, which can be strung on kabobs or even old water bottle wires. You can also give them branches of fruit woods (I use apple and pear - I believe that there are others that are safe but I don't feel confident enough about it to list them - other sites will have lists). You can also create your own toys from pine but make sure that there aren't any nails that can be exposed when they are chewed. The chins both like short, pencil sized, pieces of apple wood which they will come and take and then run off with and destroy. Lindsey emailed me to say her degus enjoy destroying wooden "dolly" style clothes pegs attached to the side of the cage. There are a vast array of chews available for small rodents and they are popular with most of them although Guinea Pigs chew less enthusiastically than the others. Lava chews seem to get destroyed quite quickly in our household but cholla is also popular and I find I can hide small bits of food inside the smaller pieces for added interest. I got hold of a packet of small pumice pieces which my male degu loves - he carries them all upstairs and makes a lovely pile of them in his hammock. Instead of making feed times easy why not hide some of their favourite food. When I have time I hide all of the Jirds food inside their boxes and toys around the cage so they have to find it to gather it up. This is less suitable for Chinchillas and Guinea Pigs who like to graze continually although you can get feed balls that have to be rolled around to get the food out which are quite good for Guinea Pigs (they are plastic so not suitable for chewers). Small willow balls sometimes have holes in them just large enough to get a raisin into (or at least one chopped in half). So instead of a raisin lasting between 1 (Spike) and 10 (Fluff) seconds they now take much longer to dismantle the ball and get the raisin out.I've also done a similar thing by taking a small piece of cardboard and rolling it up with the raisin in the middle. Why not try hanging bits of vegetable on a string so that they have to chase it. You can buy toys with bells designed for this as well. A Bunny Kabob is shown in the picture below - the plastic only really makes it suitable for rabbits or guinea pigs but you can get similar all metal ones. Or I ram monkey nuts securely into the roof of the jirds cage so they have to hang upside down and chew them out (now I write it this seems a bit mean really!). 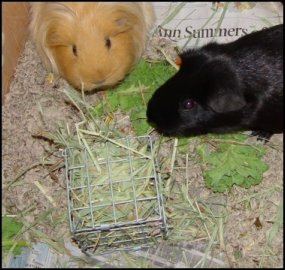 Always make sure that the grazing rodents (Chins, Rabbits, Guinea Pigs and Degus) have a constant supply of good quality fresh hay and water but apart from that making the food a little more difficult to find or get makes life more interesting. With animals that store food such as Jirds and Degus it is ok to give them one night a week where they have to use their food store. Hay holding cubes are good for two reasons. The first is it makes it a little bit harder to get the hay out and the second is that it keeps the hay off of the cage floor and clean. I have them with my guinea pigs and they love to carry them into their hiding boxes so they can eat in peace using them to block the doorway so another piggie can't get in and turf them out. These again are probably best for rabbits and guinea pigs as they could be a leg hazard. Everyone, with maybe the exception of guinea pigs, loves a dust bath with chinchilla dust. 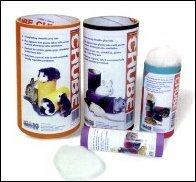 Chinchillas and Degus should have them but Jirds and Gerbils love them as well and it helps keep their coats nice. Our Persian Jirds are actually litter trained and only use an old steel chin dust bath as a toilet - I just make sure it's changed regularly. I am also starting to use this method with the degus as well to stop them peeing from the top mesh shelf. I believe that rabbits will also use one. If anyone has a Guinea Pig that likes a dust bath I'd love to hear from you - I tried Truff with one but he just ignored it. Not so much a toy as environment enrichment. The daylight animals (rabbits, guinea pigs, gerbils, Shaw's jirds and degus) should have some natural sunlight. It is very bad for them to be stuck in the back of a dark room all day and can lead to health problems. Obviously hot sunlight in summer can kill them so it is important to be careful but if you can get them as much as possible in winter and some early morning light in summer they will appreciate it. My elderly gerbils used to love a sunbathe and the degus cage is in a position that they get the morning sun (see below). Guinea Pigs and Rabbits should, of course, spend as much time as possible out in a run on dry grass in the summer, with shelter from the sun. Guinea pigs prefer to keep out of the sun though and I tend to put an old sheet over the cage to make them feel secure. Chinchillas should get natural daylight during the day but are naturally nocturnal obviously they really will not appreciate sunlight at all. Persian Jirds are also nocturnal and I have never seen them sunbathe in the way that gerbils do. How much your pets need to come out for exercise depends upon the size of their cage and whether they have a wheel, but they will all benefit from time out. Chinchillas particularly need to be let out and entertained (and watched like a hawk to stop them getting themselves into trouble, see the chewing page). When you first have an animal it will take them a while to be happy out of their cage. The best sort of exercise is to allow them to come out of their cage themselves and be able to get back in at any time. In this way they will naturally explore their environment and will not become stressed. I allow Dizzy the degu out regularly and she likes to rip up tubes and boxes for bedding and bring it back to her cage - really naturaly foraging behaviour. If I had the time I would also train her to collect her pellets for her evening meal in this way as well! Guinea Pigs benefit from coming out sitting on your lap and being brushed with a soft brush - give them something to munch on and they will soon get used to it. Once they get tamer they also love to go for a good run either in a run outside or around the room inside. Smaller animals that are more difficult to catch such as gerbils and jirds can be allowed to come out of the cage and run around your arms and shoulders. We also used to exercise our gerbils by letting them run up and down the stairs with one of us at the top and one at the bottom. This is also a good opportunity to check your pet over to make sure that he/she is healthy. Remember ears, eyes, mouth, skin, bottom, feet!! Chinchillas like to jump between perches and there are a number available. There are wooden perches available for parrots, plus cholla which is hollow and made out of a dried cactus (no spines of course). You can also get chew toys made out of cholla. 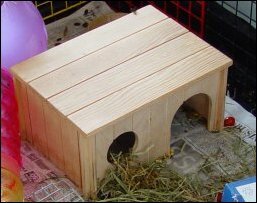 There is also a product called Leap 'n' Ledges and Sleep 'n' Ledges that are wooden ledges with a bolt on the back for easy attachment to the side of your cage. We have some in the Degu cage shown below but you could make your own much more cheaply from some pine and bolts from a DIY store if you are even vaguely practical. There are also pine shelves available to buy on the internet and eBay if you look. Make sure that you have read the General section before reading these Guinea Pig specific ideas. Guinea pigs generally aren't very interested in the chew toys mentioned on this page. They do, however, love tubes and hiding places. Guinea pigs should always have at least one hiding place each and probably a spare one or two. In addition to cardboard and wooden boxes you can use the tubes and balls sold for ferrets as toys. Guinea pigs need a lot more ground space to run around in than you get in the average hutch. They often will run around at great speed doing little jumps into the air (pop corning). Once you have your guinea pig tame they will enjoy a run around the house and of course they will love an outside run in the summer. The best environment for guineas is of course in a run with a hutch attached in the summer so that they can let themselves out at will but you much be very careful that they cannot be got to by cats or foxes. This may mean building a foundation for the run. In the winter they are happier and healthier indoors. 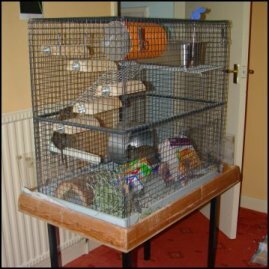 See the guinea pig cages page for details of making a cheap indoor run. A good guinea pig pen has enough space for them to run around plus boxes and tubes, something to chew on and unlimited hay (best kept clean in a hay rack or cube). We have removed the dividers in our hutch and replaced them with wooden boxes that they can run around the back of, so providing the maximum running room. As mentioned above plastic rollaround toys (Boredom Busters or Treat Tumblers are two types) are sold for rabbits and these are great for putting your guinea pig's food in. Our guys had unlimited good quality hay freely available but had to push balls for their pellets. Some guinea pigs will also indulge in rooting behaviour where they dig in their bedding to find food. I noticed that mine do it for bits of food that have fallen out of the food ball and dropped down into the bedding - there's quite large spaces in the Ecobed chopped cardboard that I am using these days. It's not necessarily something you'd want to encourage in shavings but with something like Ecobed it's possible to hide small amounts a mix for them to find and dig out. 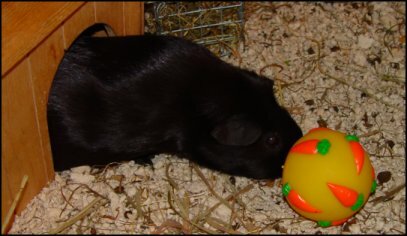 Truffle is easily amused pushing the treat ball around to get the nice food out. Hanging their vegetables on Bunny Kabobs or just a piece of string will keep them amused for longer than just being put in their bowl. Check out some of the rabbit toy sites on the Pet Shopping page for more suitable toys. Toys don't need to be expensive. I have heard of people stuffing toilet roll inners with hay for them to pull out and also Sarah emailed me to say that she wraps hay or food up in twists of paper for them to find.